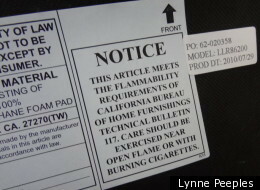 Flip over your couch cushion or desk chair and chances are, you'll see the same tag that is affixed to the bottom of many others: "This article meets the flammability requirements of California Bureau of Home Furnishings Technical Bulletin 117." The black-and-white notice also adorns an array of children's products, including car seats, strollers and baby changing mats. It might as well be a red flag, according to many health experts who caution that the added chemicals likely pose a greater health risk than any flames they might fend off. Common flame retardants have been linked with learning disorders, reduced fertility and cancer, they say, and non-chemical alternatives do exist. "Protecting children from fire doesn't require exposing them to toxic chemicals," said Ivy Sager-Rosenthal, campaign director for the nonprofit Washington Toxics Coalition. But convincing legislators and the public of this point remains difficult, she added. A key obstacle to policy change is the millions of dollars that the chemical industry invests to promote the use of flame retardants. Washington state's Toxic-Free Kids Act, which was returned to committee by the House of Representatives on Saturday, would be the first legislation in the country to ban the fire retardant chemical known as chlorinated Tris from children's products. The chemical was actually barred from children's pajamas in the 1970s due to toxicity concerns. Last year, the California Environmental Protection Agency declared it a carcinogen. Toxic flame retardants were found in 80 percent of baby and children's products tested in a recent study. The most common: chlorinated Tris. Of course, the chemical is on just one branch of an aging family tree. When Congress banned polychlorinated biphenyls (PCBs) in the 1970s, the industry began employing an alternate flame retardant called polybrominated diphenyl ether (PBDE). When PBDE was discovered to be just as harmful, the industry looked again for swappable chemical cousins, including chlorinated Tris. "We will continue to oppose efforts by state legislatures that would remove fire protection options unnecessarily. The bill in Washington is one such bill. [Chlorinated Tris] was evaluated by the European Union, which found the chemical does not raise concerns for human health," said Jackson Morrill, director of the North American Flame Retardant Alliance, an arm of the American Chemistry Council, a lobbying group for the plastics industry. "Given that fires remain a significant threat, particularly to young children and the elderly, it is in the best interest of public safety to make sure that [chlorinated Tris] remains a tool in the fire safety toolkit," Morrill told The Huffington Post. Washington State Senator Sharon Nelson (D-Maury Island), co-sponsor of the Toxic-Free Kids Act, noted that her bill will probably be revisited in a special session. The proposed legislation also addresses a less widely used flame retardant, TCEP, which is already banned in New York State. "Chlorinated Tris is the most important, and the chemical industry got it out of the bill in Ways and Means. It's back in now -- excellent news for our children," said Sen. Nelson, who has two grown daughters. "I look back on what they could have been exposed to, and I'm concerned." The state's ban would go into effect in 2013 but could be delayed, should the industry agree to assessments to ensure any replacement chemical is safe, instead of substituting yet another chemical that might later prove equally as toxic. As Sager-Rosenthal put it: "We're on a toxic treadmill and can't seem to get off it." This is exactly why Arlene Blum, executive director of the Green Science Policy Institute, an environmental health watchdog and research group, suggests that chemical bans aren't enough. "There are so many chemicals. If we ban one, there's always another," said Blum, whose findings in the 1970s led to the ban on use of flame retardants in children's pajamas. She also pointed to research that suggests that the fire safety benefit of these chemicals is minimal. Last month in California a bill was introduced -- also strongly opposed by the chemical industry -- that would revisit the decades-old fire safety policy, 'Technical Bulletin 117,' to change the criteria for testing flame resistance and allow manufacturers to meet the requirement without added chemicals. California is currently the only jurisdiction in the world that requires furniture and children's products to withstand a 12-second open flame, but as a consequence of its requirement, products in all 50 states are permeated by the toxic chemicals. The proposed smoldering test would more closely resemble one of the most common sources of house fires -- a burning cigarette -- and would be required for fabrics rather than foam filling currently tested by open flame. Most furniture would already meet this new standard, noted Blum, and many of the rest could simply switch to less flammable fabrics. A crib mattress, for example, could be covered by a cotton cloth. Sager-Rosenthal suggests that other factors are still more important in preventing fires, such as not smoking in bed and the use of smoke detectors. The challenges to parents are vast and complicated. "Products aren't required to be labeled as containing these chemicals," said Sager-Rosenthal. "Parents almost have to be scientists to determine if the chemical is contained." Meanwhile, parents must also worry about chemicals long-since banned. According to Linda Birnbaum, director of the National Institute of Environmental Health Sciences, about 70 percent of PCBs remain in the environment. Researchers estimate similar numbers for PBDEs. Birnbaum explained that flame retardants are generally mixed into the plastic or foam of a product. "There is no chemical bonding," she said. "So they can easily escape into the air and the dust." "This is of great concern for children," added Birnbaum, "as it ends up on hands and ends up in mouths."